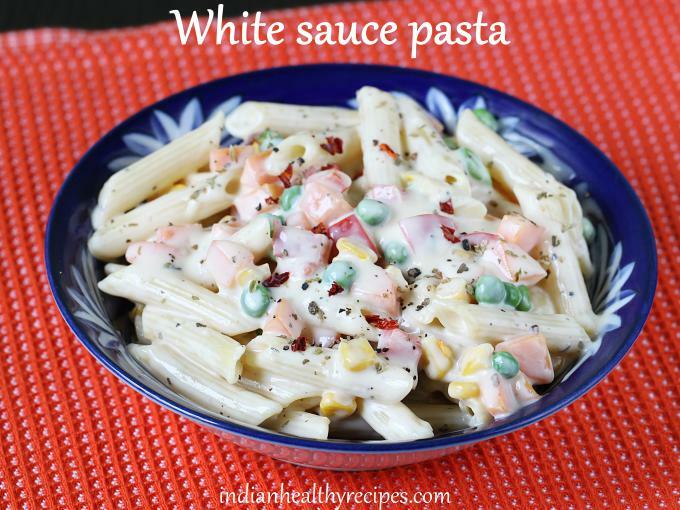 White sauce pasta is a delicious dish made of pasta, butter, milk, cheese & herbs. It is basically cooked pasta tossed in cheesy white sauce. 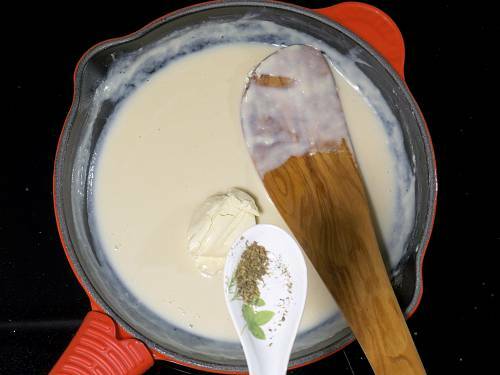 White sauce is also known as bechamel sauce & is made using flour, butter and milk. It originated from the Italian & french cuisines and is a base for many other sauce recipes. It is used in the preparation of various dishes like pasta, lasagne and pies. 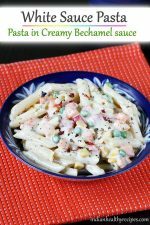 This cheesy white sauce pasta is a favorite with my kids and I make this with so many different variations. The recipe shared in this post is the basic vegetarian version. Feel free to tweak & add in your favorite veggies, shrimp or chicken. I have flavored this white sauce pasta with just some oregano, pepper & red chili flakes. However you can also add Dijon mustard, mixed herbs or garlic for added flavors. For variations use heavy cream or cheddar cheese or cream cheese to suit your taste. There are a lot of options to tweak this basic recipe. 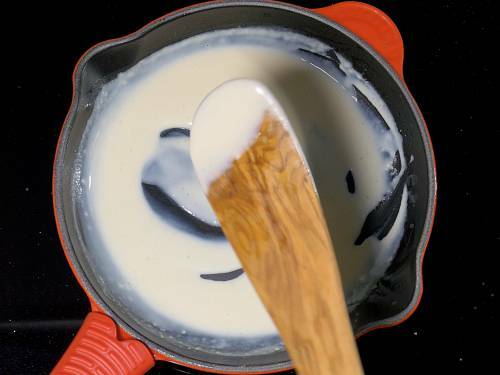 Using full fat milk and cheese are the key to making yummy and delicious white sauce. Usually cheddar cheese or parmesan cheese or a mix of many kinds of cheese are used to make this pasta. But I have used cream cheese here since this is the only one I found without calf rennet. You can also use the same recipe to make chicken pasta in white sauce, it turns out good with mustard and lots of black pepper. 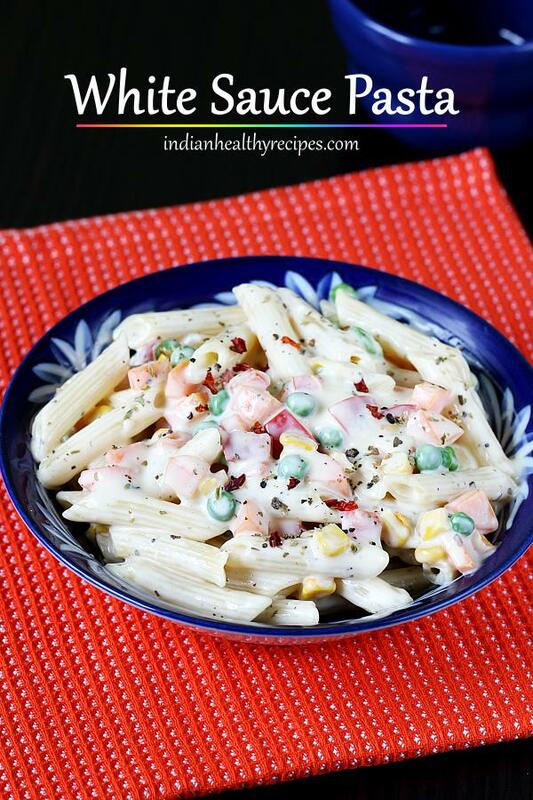 White sauce pasta is a vegetarian, creamy & delicious dish made of pasta & herbs tossed in bechamel sauce. Bring 4 to 5 cups water to a boil in a large pot along with salt. 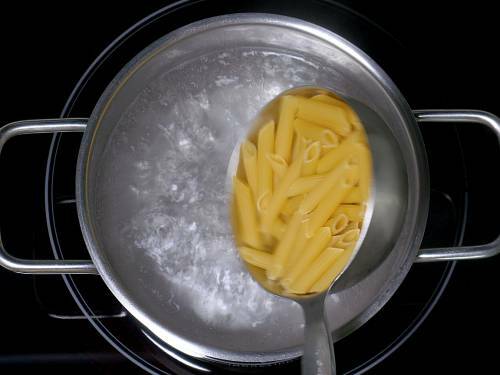 When the water begins to boil rapidly then add pasta and cook al dente. Drain off completely reserving 2 to 4 tbsp of water. If using veggies, chop them and set aside. You can also use frozen mix veggies like carrots, peas and sweet corn. 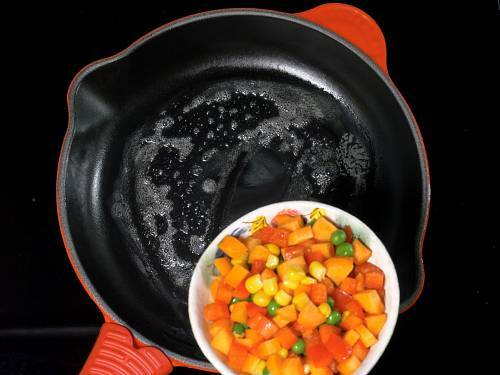 Add 1 tsp oil to a pan and saute vegetables until al dente. Set these aside. Set the flame to low. 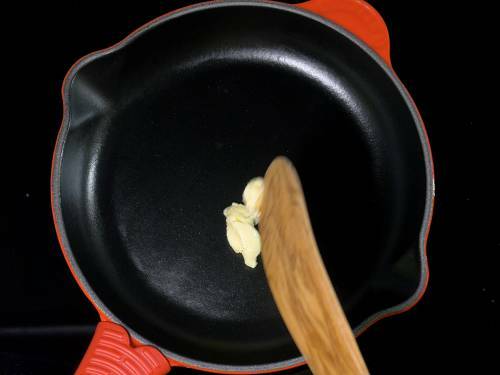 Add rest of the butter to the pan and saute the garlic for a minute. Then add flour. Saute it in butter until the raw smell goes off. The flour may turn slightly lumpy. Just break up the lumps and continue to saute until it no more smells raw. Make sure the color of the flour doesn’t change. Pour ¼ cup of milk. Whisk continuously breaking up the lumps. I used a spatula to break up the flour. When you see the flour is well blended with milk, pour rest of the milk and mix well. Cook this until the sauce turns slightly thick. Add cheese if using and gently stir until the mixture reaches a thick sauce consistency. Next add oregano and pepper. Switch off the stove. Add more salt if needed along with veggies & cooked pasta. 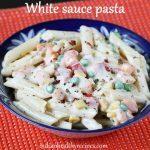 Mix well to coat the pasta with the creamy sauce. 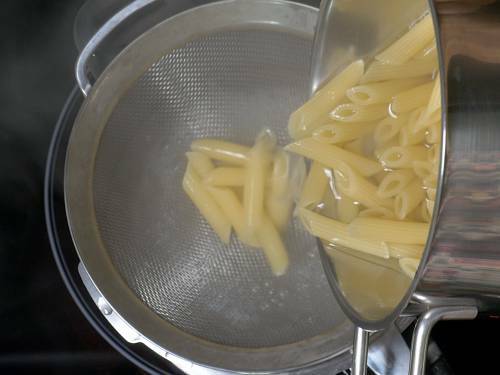 If the sauce is too thick then, you may add 1 to 2 tbsps of reserved hot pasta cooked water. Serve white sauce pasta immediately. If you do not prefer to use regular dairy milk in this recipe, then soak about 12 to 15 almonds for 2 to 4 hours in warm water. Remove the skin and blend them with just 1/4 cup water to a smooth paste. Then mix with 1 cup water and make it 1 1/4 cup as needed in the recipe. If your blender does not blend almonds well then you may need to filter the milk and use. A mini blender or a bullet works good for this. 1. 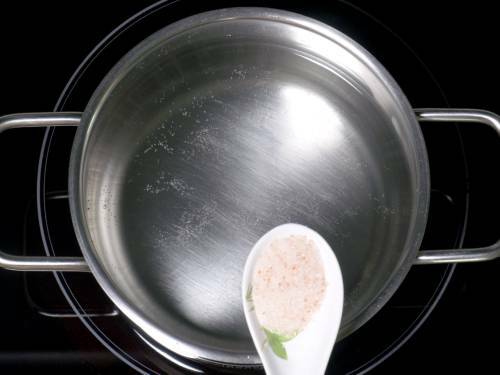 Add salt to 4 to 5 cups of water and bring it to a rapid boil . 2. Then add pasta. I used organic pasta. Cook as per instructions until done al dente. 3. Drain to a colander and reserve some water. 4. 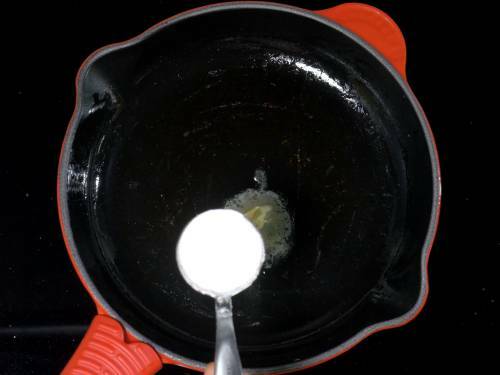 Pour oil to a pan. 5. Saute mixed vegetables until they are slightly tender yet crunchy. Set these aside. 6. Add more butter and then saute the garlic for a minute. I did not use garlic. Then add flour. 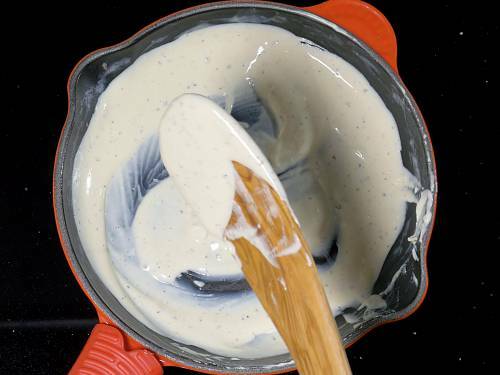 To make white sauce a generous amount of butter is used to dissolve the flour. I had to reduce it due to personal preference. 7. Saute well until the flour loses the raw smell. 8. 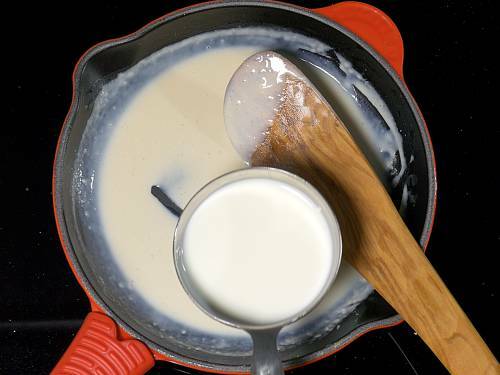 Lower the flame completely and add ¼ cup milk. 9. 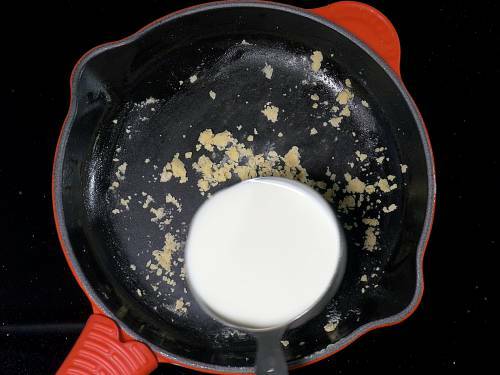 Begin to stir with a spatula and dissolve the flour completely without any lumps. 10. Pour the rest of the milk and stir. Do not pour milk at this stage until you break up the lumps of flour and dissolve it completely. 11. Cook this until the sauce slightly thickens. 12. Add cheese if using. Also add pepper and oregano. 13. If needed add salt. Mix well until the cheese blends well. If the bechamel sauce is too thick you can add the reserved pasta cooked water/ stock. Switch off the stove. 14. 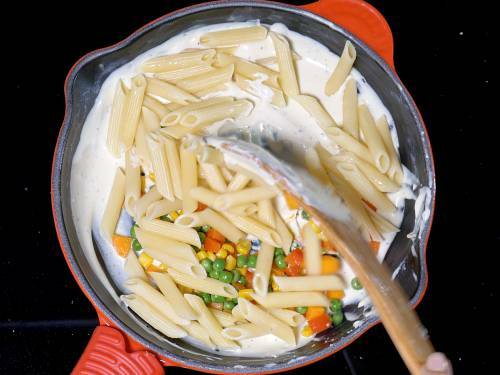 Add vegetables and pasta to the white sauce. 15. Mix the white sauce pasta well. If needed you can add more pasta cooked water to make it creamy. Garnish white sauce pasta with red chilli flakes and crushed pepper. Hai tried your macaroni recipe it came out very well. For this white sauce pasta can I add mushrooms instead of vegetables. Thanks for trying. Yes you can add only mushrooms. This turned out to be extremely delicious than what I expected. Will be making it again. it looks nice,will definitely try it.Thanks for the recipe. Thank you. Yes do try it. instead of butter can we use ghee? Yes you can use it. Do not cook after adding it. For salads you can use Feta cheese or cream cheese. for Pizza you can use mozarrella or four cheese. Not all kinds are vegetarian. If you do not consume products with animal rennet then you need to check the packing. This is s first time I ever tried pasta. Luckily every ingredient at home when I wanted to try this . My 4 year old boy saying “ yummy . Thank u mamma it’s so nice. All credits to you thank u?? You are welcome. So happy to read your comment. I know it’s so hard to please the kid. Wow… Too easy… But don’t it need any mionees?? ?